The day after Thanksgiving has become an opportunity for bargain-hunters to snag some great deals on gifts for others and themselves. For others, it has become a day to relax at home and avoid the massive crowds. Now, for those who would like to see the day known as Black Friday be something everyone can cherish, there is Fuller Friday. Fuller Friday is an opportunity to give a gift that truly changes lives — the gift of a simple, decent home. "Every year about this time we start the search for the perfect gifts, but the whole process has become increasingly commercialized," Fuller Center for Housing President David Snell said in statement. "There’s no more striking symbol of that than Black Friday. On one hand it’s good that we take time to think of our loved ones and honor them with gifts, but, my goodness, we do seem to go overboard!" "Fuller Friday offers a unique opportunity to remind us of the true spirit of Christmas, the day we celebrate God’s gift of His son to redeem us all," he added. "Throughout His ministry, Jesus taught that the greatest commandment — after loving God — was to love one another, to take care of the poor and the afflicted, and to reach out to those in need. "A great way to do that is to share of your blessings to help a family in need to have a decent place to call home, and Fuller Friday is a great way to do just that. Whether you’re making a gift to a family through this ministry or giving an alternative gift to a loved one you can be sure that you are doing just as we’ve been counseled to do — loving others and reaching out to those in need." 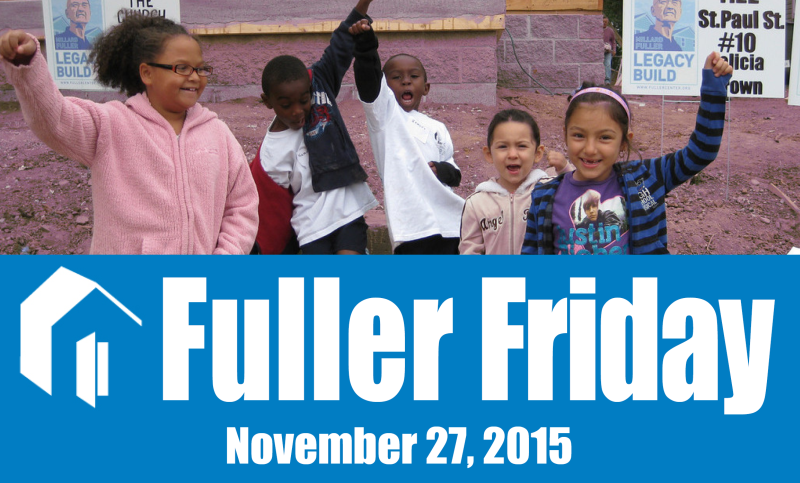 If you would like to honor a loved one with a gift on Fuller Friday 2015, please click here. You’ll have the opportunity to receive a Christmas card that you can give your loved ones to let them know they inspired your gift.